In this expressly Islamic state, well over 90 percent of the populace shares the same basic faith, yet throughout Pakistan’s history…that surface unity has masked great diversity and deep divisions. The divisions are especially evident in Karachi, which after receiving migrants from many places is Pakistan’s most diverse city. Karachi also faces a diversity of conflicts, which came into play after the Ashura bombing. But while Instant City revolves around the Ashura bombing, it does not remain fixed around that day. Instead, the incident is strung into the broader narrative of identity & tragedy – how a country that was established with such hope and promise could have veered so drastically off course. Inskeep uses a steady stream of anecdotes, showcasing Pakistan’s history since the 1947 Partition and introducing familiar characters from the Pakistani fabric – Ardeshir Cowasjee, Abdul Sattar Edhi, and even Mohammed Ali Jinnah. As far as I can speak for Pakistan, I say that there is no reason for any apprehension on the part of the minorities in Pakistan. It is for them to decide what they should do…I cannot order them. Both Pakistan and Karachi are dubbed as peculiar, and this is a simple but apt reference. Pakistan is a country built on an idea, with aims purposefully vague, undefined, and lofty. Inskeep wrote, “Much of Pakistan’s history – and Karachi’s history – would be driven by the tension between the aspiration and the act.” Dawn columnist Cowasjee, a Karachiite through and through, told the author, “Jinnah told my father…that each government of Pakistan would be worse than the one that preceded it.” We are a nation that oscillates between extremes, schizophrenic in our intentions and unsettled in our reality. In the 60-plus years that we have been a state, we seem more uncomfortable in our skin than ever before. Though Inskeep’s book focuses specifically on the lights – both glittering & fading – of Karachi, the theme is very indicative of the wider national phenomenon. Life and death are two absolutes that are juxtaposed in the same daily reality in Karachi. Instant City is a great read for a number of reasons. First, Inskeep rightly fixes his position as a humble observer instead of a smug pundit, making the book appear unassuming and non-judgmental. Second, he successfully weaves in a number of smaller narratives that showcase the multifaceted personality of Karachi and humanizes its history. Third, though there have been some criticisms surrounding the importance placed on the 2009 Ashura bombing in the story [some feel the Shiite attack was not indicative of Karachi’s wider issues], the underlying themes surrounding the incident and subsequent burning (most likely perpetrated by the city’s embedded land mafia) do speak to broader issues currently raging in Pakistan as a whole. In short, Inskeep’s book is unique in its voice, refreshing in its outlook, and nuanced in its approach. Is it the best treatment of the numerous issues facing Karachi today? No. But it also doesn’t claim to be. It offers a fresh voice, something I at least was grateful to see. 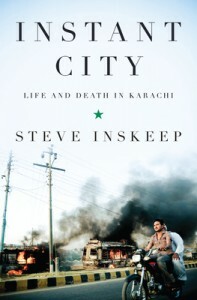 To purchase a copy of Steve Inskeep’s Instant City: Life & Death in Karachi, click here. 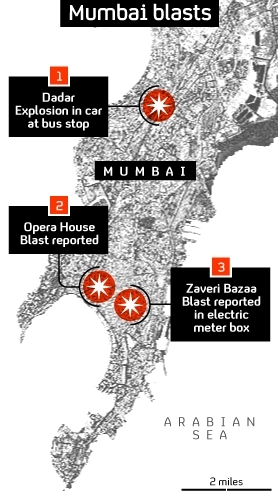 There were three blasts in Mumbai today during rush hour today, reportedly hitting Dadar, Opera House and Zaveri Bazar areas. According to the Guardian’s live updates, “There were no confirmed numbers of fatalities or injuries but NDTV quoted reports saying 10 people have been killed,” while the Indian Home Secretary says over 60 people have been injured. The numbers are likely to rise. Although BBC News reported, “The blasts coincide with the birthday of Mohammad Ajmal Amir Kasab, the sole surviving gunman from the 2008 Mumbai attacks which killed nearly 170 people,” this is untrue. Kasab’s birthday is in September (!). There is no news yet on who perpetrated the blasts, but according to NDTV, this was confirmed as a terrorist attack. At this time, a lot of people like to perpetuate rumors. I’ll be following news outlets and journalists on my Twitter timeline and keep this space updated. Our prayers go out to those in Mumbai. UPDATE 1100 EST: NDTV reports Mumbai police & the Home Ministry suspect the Indian Mujahideen. NDTV is now discussing the areas were targeting, noting that the three areas were all very crowded and the “near-simultaneous” attacks occurred at a time at a busy time (7:00 pm IST). Al Jazeera noted that this attack occurred just a few days after the anniversary of the 2008 Mumbai attacks. The home ministry said it’s a terrorist attack and has rushed three teams from the newly-created National Intelligence Agency to Mumbai, including forensic experts. Most people were injured at Zaveri Bazaar, where Mumbai’s bullion traders and jewelry shops are located, and at Opera House, where diamond exporters have their offices and workshops. Zaveri Bazaar is close to the city police headquarters, and has been bombed by terrorists twice in the past – in 1993 and in 2002. This time the improvised explosive device was placed inside an electrical meter box. The third blast was near Dadar Railway Station in central Mumbai at a road intersection known as Kabutar Khana (Pigeon House), where devout Hindus come to feed the city’s pigeons. UPDATE 1120 EST: Via the Express Tribune, the MP of South Mumbai tells NDTV – avoid rumor mongering, avoid messages that spread communal discontent. NDTV also says that an IED has been found hidden in an umbrella. The Home Minister says that the official casualty account is 10 dead, 54 admitted to hospital [i.e., injured]. Two teams from Delhi and Hyderabad have been dispatched to Mumbai, which has been put on high alert. The Home Minister is appealing for calm. UPDATE 1142 EST: Death toll has risen to 13. Crowd management, according to Al Jazeera English, is an issue and an impediment to rescue work. The most intense blast was at the Opera House. Officials are urging people to remain calm to facilitate in these efforts. 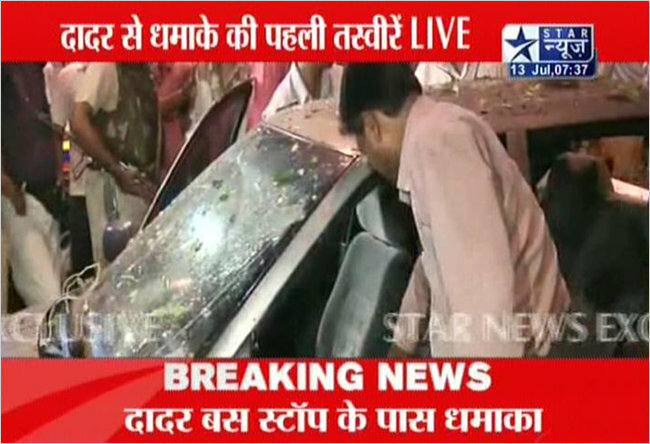 NDTV spoke to Prithviraj Chavan, chief minister of Maharashtra, home of Mumbai, who said the number injured is now 83 . He also did not want to comment on who the perpetrators of the blast are – saying instead that their first priority is to help people in need. UPDATE 1155 EST: 13 people killed, 81 people injured is latest count, via NDTV. All three blasts were caused by IEDs. Via the WSJ, “Vikas Mahekar, a member of the Maharashtra nationalist group the Shiv Sena, in Colaba: “We immensely condemn the attacks…All these talks of a safer Mumbai is just an eye wash. The reality is out for everyone to see today.” Because of the low-intensity of the blasts, hope the toll will stay relatively low: NDTV (Strongest was at Opera House, where the IED was hidden in an umbrella). UPDATE 1205 EST: Via the Guardian updates, “NDTV is reporting that two members of the Indian Mujahideen, who have been blamed by Mumbai police for the attacks, were arrested in the city yesterday.” Again, remember that Indian officials are not commenting on who committed the attacks. UPDATE 1210 EST: Via Twitter, @AnandWrites has created a crisis crowdmap post-attack. Here it is. UPDATE 1330 EST: NDTV keeps speaking to eyewitnesses, who basically discuss the chaos and the blood that was “everywhere.” Via the WSJ, “News channel NDTV says police are already looking at footage from a CCTV near the bus stop in the Dadar area and another in the Opera House area.” Death toll has risen to 21, 120 injured. According to NDTV, the leads are “currently very sketchy.” According to the Home Minister, all of the injured have been taken to hospitals. The blasts occurred at 6:45 pm IST, within minutes of each other, therefore allowing officials to conclude that attacks were coordinated. UPDATE 1630 EST: (Last one of the day) Death toll: 21 dead, 141 injured. We tend to need Pakistan more than Pakistan needs us. That’s the current dilemma, because in many ways the United States is utterly dependent on Pakistan for logistical access to Afghanistan. In some respects this situation is paradoxical, because in my own view the United States is in Afghanistan more to avoid destabilizing Pakistan than for almost any other reason. So based on the punditry and statements, here’s what we have: the U.S. knows they can’t fully cut off Pakistan. Pakistan knows that the U.S. knows this. 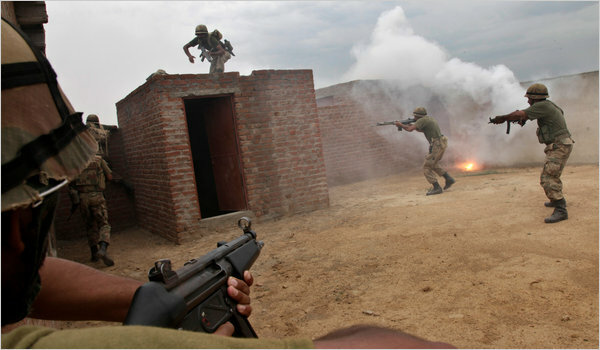 Pakistan knows they can’t fully disengage from their relations with the U.S. The U.S. also knows that Pakistan knows this. So both know stuff that the other knows they know. If you’re like me, your head hurts right now too.